October 23, 2005, began as a calm day in Dilcia Edreida Alarcón’s hometown—Playa Rosario, a fishing village just south of Havana. But around 6 p.m., she noticed the waves. They were huge, and getting bigger—up to four meters high—breaking closer and closer to her beachfront home. The radio alert she had been waiting for came: Wilma was furiously churning toward Cuba’s south coast, the most intense hurricane ever recorded over the Atlantic. 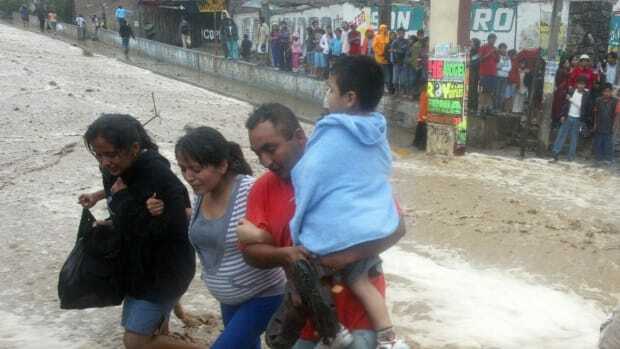 As the waves pounded the shore, Alarcón and her neighbors gathered everything they could, and fled. Officials from the ministry of civil defense took them to an inland shelter to wait the storm out. This was the most active hurricane season ever recorded over the Atlantic: Katrina had blasted through New Orleans just two months before, and Wilma was the fifth in a series of record-breaking storms that caused nearly 1,700 deaths and $100 billion in damages in the United States alone. Rosario residents had weathered many storms over the years, and been evacuated often. After each hurricane, they returned to re-build their ravaged homes. But this time was different. Cuban land use officials knew Playa Rosario was doomed. The sea was rising, and Rosario was built on sinking land. 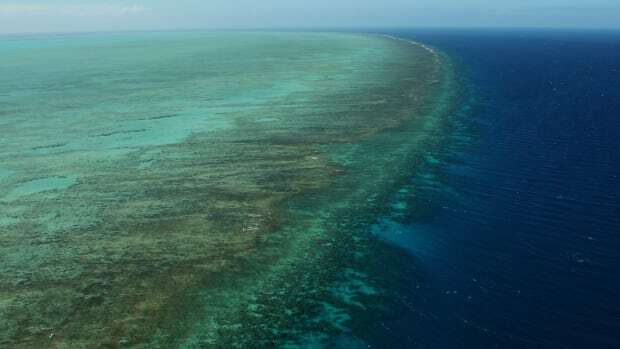 It would be completely submerged by 2050, and the shoreline was already retreating as much as three feet per year. Every hurricane scraped more dirt and sand from the crumbling shoreline, and, in the years to come, the waters would keep rising higher and the storms would keep getting stronger. After the hurricane, Alarcón and her neighbors were told they couldn’t return to what was left of the town (only three of the 113 homes were still standing) and instead were transferred to a temporary shelter, where many have remained for the past 10 years. Cuba is on a tectonic seesaw, much of its north coast rising while the south coast beneath Rosario subsides. 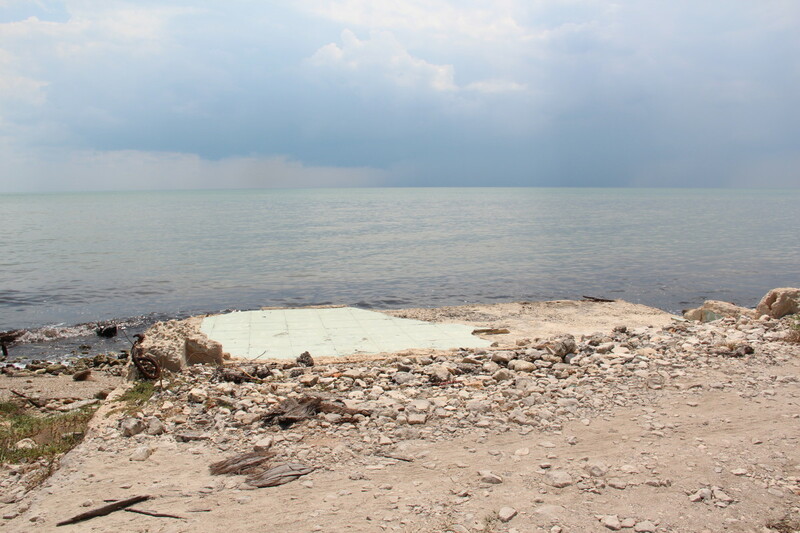 Today, all that’s left of Playa Rosario are the foundations of homes, now crumbling into the sea. The main road is completely submerged, and spring water bubbles up through the remains of an old patio. Skeletal house remnants face the sea, contemplating the water’s edge as they are slowly engulfed: one and a half feet deeper every year. It’s a ghost town. The house where Alarcón’s three sons were born is underwater, and now she lives in government housing eight miles inland. “El mar se comió todo,” she says. The ocean ate everything. Playa Rosario’s heyday was Alarcón’s youth. The town was always a humble place, just a handful of simple homes on the beach, but in the 1960s Cuban tourists would visit by the busload. They came to fish, play, and cure their ailments by taking the waters—a sulfur-rich underground spring flowed into the sea and bubbled up through the mud. Doctors would prescribe baths at Rosario for rashes and asthma. Residents fished for shrimp and lobster and bartered for produce with farmers in the surrounding countryside. Only a few hundred people lived there but the town’s impact on the coastline was soon apparent. They built houses and a road right on the beach, at the expense of the coastal mangroves. They drained the aquifer, and saltwater from the sea soon crept in to the fresh natural water they were so proud of. Without the mangrove barrier, hurricanes and waves ate away at the coast, which was already low. The town was only about 10 inches above sea level, and even without the constant erosion, the whole coast was always slightly sinking—Cuba is on a tectonic seesaw, much of its north coast rising while the south coast beneath Rosario subsides. 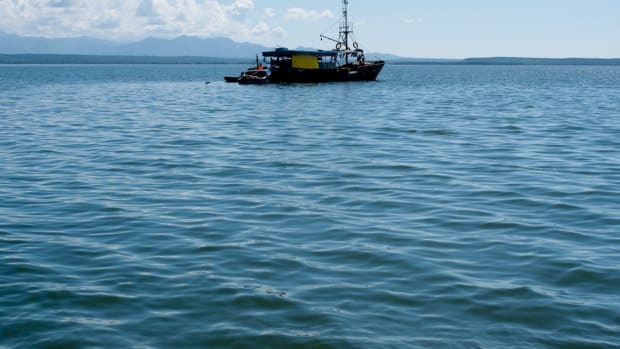 For 20 years, Cuban scientists have watched the waters rise. Cuba is shrinking, and there’s nothing they can do but adapt. The plight of Playa Rosario’s residents is a preview of what could happen all along Cuba’s edges. The island is long and very thin—at its widest point it only takes about two hours to drive shore to shore. Ten percent of Cubans live along its 3,735 miles of coastline, and tourist beaches and coastal resorts generate $2.6 billion each year. The government has anticipated climate change as an existential threat to these communities and businesses for years. In 1991, before any international effort to address climate change was in place, Cuba formed a national commission to predict global warming’s effects on Cuba. Two years later, at the United Nations Earth Summit in Rio, Fidel Castro conveyed his view on the gravity of the situation in an address to other world leaders: "An important biological species is in danger of disappearing," he said. "Mankind." In the 23 years since then, Cuban officials have continued to urge action on climate change at international meetings, with more fiery rhetoric. But to no avail. For 20 years Cuban scientists have watched the waters rise. Cuba is shrinking, and there’s nothing it can do but adapt. The people of Rosario were forced to adapt by retreating from the water’s advances. The settlement prepared to receive Playa Rosario’s residents is eight miles inland, a cluster of two-story apartment buildings at the end of a dusty road, bordered by train tracks and cornfields. The concrete walls are strong enough to withstand the next hurricane, and the finished houses are painted bright baby blue. 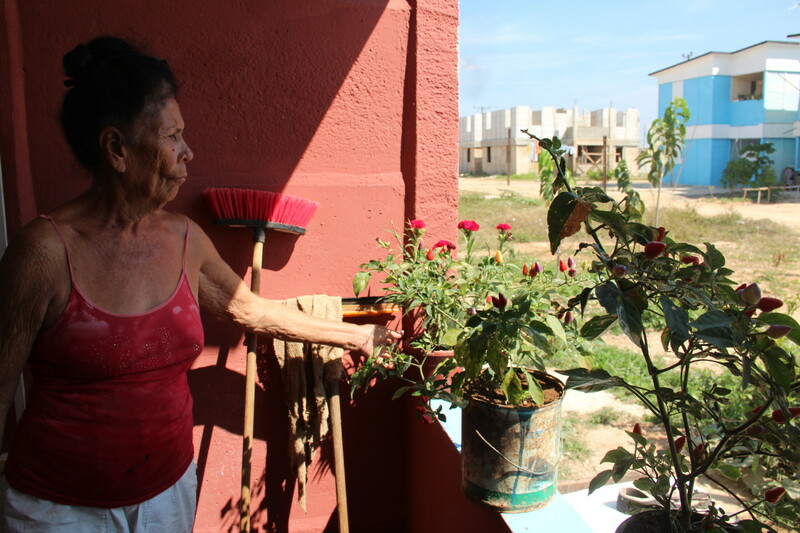 Alarcón lives in a first-floor apartment with four rooms, lace curtains in her bedroom, and a garden outside—something she could never have had in the sands of Rosario. She’s been here seven years, one of the 100 or so Rosario refugees who have moved in. But, 10 years after their evacuation, there still aren’t enough homes for all 300 of her former neighbors. 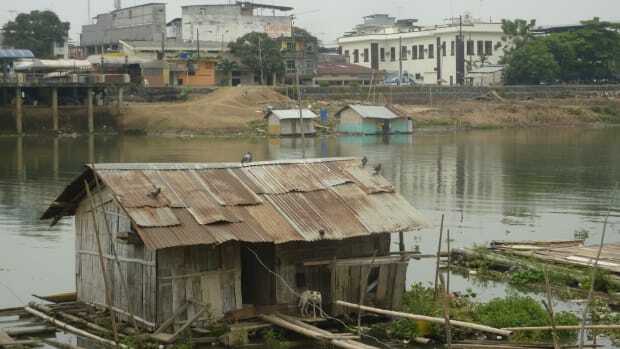 Some finished houses stand empty because the lagoon that receives the settlement’s wastewater doesn’t have the capacity for more people. Many others are still under construction. “We have no life here,” Miliani says. But she and her family know they are the lucky ones. But Alarcón is lucky. She lives below her sister-in-law, Dalia Garcia Miliani, a cheerful woman with short dark hair and lots of laugh lines, and Dalia’s grandson, Yosiel Rojos Gil. Yosiel is 17, but his skinny frame and big eyes make him look even younger. He’s already finished school, and now he works in the fields that surround the settlement, farming corn, sugar, and cabbage. It’s hard work, Yosiel says. Where they live now, everything is far—the store, the beach, the next town. He was just seven years old when they left Playa Rosario, but he seems to pine for the life there as much as his elders do. They miss the seaside village life, when they had fish to barter for more food and goods. Now they mostly live off the Libreta de Abastecimientos, a monthly ration every Cuban gets: Two and a half kilos of rice, half a kilo of beans, a few kilos of sugar, a liter of milk per day for children and a dozen eggs—$8 worth of food, for the month. “We have no life here,” Miliani says. But she and her family know they are the lucky ones, to have real houses. The rest of the former Rosario residents still live in the temporary shelter, waiting to move into the settlement’s permanent homes. The shelter is only five minutes away by car, but a 20-minute walk in the hot sun. Yosiel’s mother lives here, just another faraway place for him to walk to. It’s small, a few one-story buildings, very close together, with crumbling cement brick walls and tin roofs. Laundry dries in the sun, and most people are inside to escape the heat. Emilio Acosta Durand and his brother Osmel sit on the floor of one room, mending a tarp they will use for fishing. The men are shirtless, their skin sunbaked to a rich tan. Emilio has his seven-month-old daughter, Emily, on his knee. “We’ve been here 10 years,” Emilio says. Emilio and Osmel lived and fished in Rosario for most of their lives. They still fish, but they have to take a motorcycle on the rough road to the beach, and come home to this dusty, dry room every night. The houses they had in Rosario weren’t any fancier, but it was nice to be by the water, Emilio says. Emily smiles and bounces in his arms. An angry red rash covers her little arms and legs. When she’s older, Emilio says, he will take her to Rosario, to bathe in the sulfur-rich water and mud that have cured Rosario baby rashes for generations. That’s also where he hopes to teach her to swim. It’s unlikely Emily will be able to take her own children to Rosario, and by the time her grandchildren learn to swim few Cuban beaches will be left for them: Five percent of Cuba will be completely underwater and 82 percent of Cuban beaches will be partially or fully flooded by the end of the century, according to Cuban scientists’ predictions. 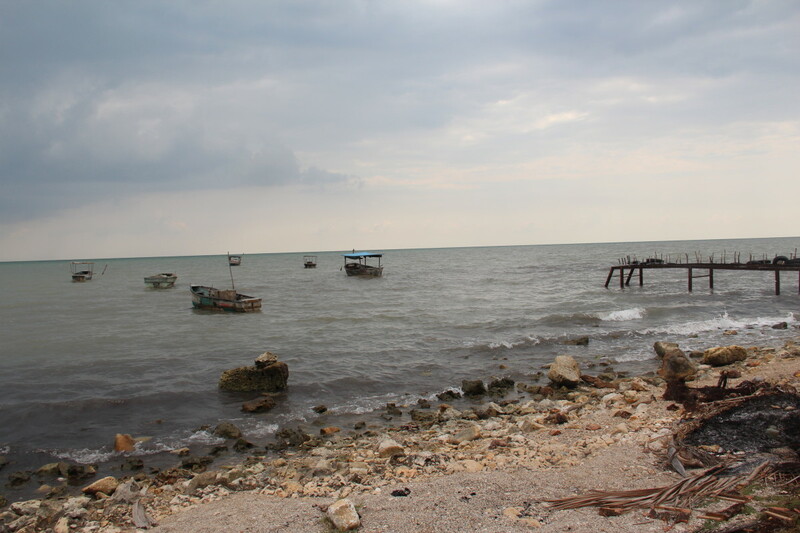 Rosario is the first Cuban town to be permanently evacuated, but the people of Playa Uvero, about 186 miles to the northeast, might be next, and there may be many more: “Re-accommodation” is one of the many prongs of the government’s climate-change adaptation plan, according to official documents. The ministry of civil defense has already embarked on a coastal protection scheme in which it demolished 287 beachfront government structures and 198 privately owned buildings since 2012. 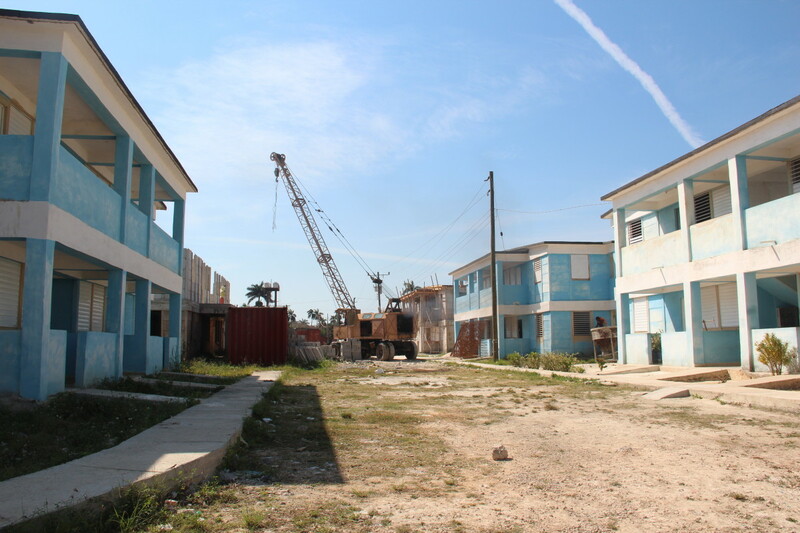 These buildings were taken down for violating Cuba’s coastal development law, which forbids construction within 40-80 meters of the shore, and building on sand dunes. The law was passed in 2000 but wasn’t enforced until 2011, after the government conducted a study on the effects of climate change and found that rising seas would swamp Cuban beaches well before the end of the century. “I think they’re just being smart,” says Dan Whittle, who works for the Environmental Defense Fund in Havana and has been involved in Cuban coastal development for over two decades. The Cuban government isn’t “trying to engineer its way out of the problem,” he says. They’re just moving out of the way, trying to stay safe for whatever comes next.